One small necklace for you, one giant leap for mankind! Wear a memento of the adventure that captured the hearts of a nation with this necklace that recreates the trajectory of the Apollo 11 mission. Measuring approximately 2.65in or 5.5 inches in length, the Trajectory Necklace is just a bit shorter than the 240,000 miles Apollo 11 traveled to the moon. Necklace is displayed on a silver plated chain. Available in steel and bronze. Bronze necklace ships within 3 days of order with 3 day shipping. Expect arrival within 7 days of order. Steel trajectory items are custom printed for you with a 21 day production time and shipped through USPS with 3 day shipping. Expect arrival in 25 days from placement of order. A trajectory is the path followed by a moving object. In this case, it is the path that Apollo 11 took from the Earth to the moon. Apollo 11 was the first ever spaceflight that landed humans on the moon. This was designed to be a free-return trajectory, meaning the gravity of the moon allowed the space shuttle to return to Earth without any propulsion. The larger circle represents the Earth and the small one represents the moon. These are both scaled accurately with the moon being 27% the size of the Earth, while the trajectory is not to scale. 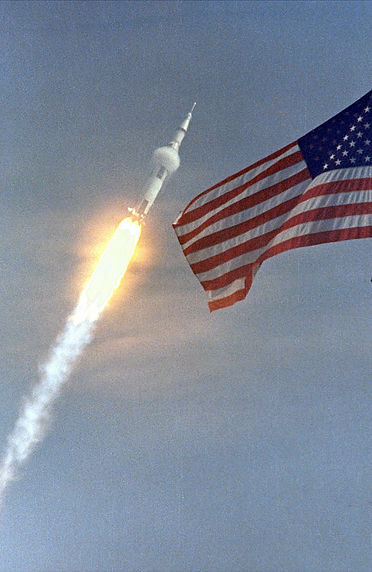 The Saturn V rocket launched from Kennedy Space Center on July 16, 1969. After liftoff, one and a half orbits were taken around the Earth. Then the orbit was broke and the space craft moved toward the moon. On July 19 lunar orbit was entered. Astronaut Michael Collins stayed about the Command Module Columbia, while astronauts Buzz Aldrin and Neil Armstrong took the lunar module to the surface. The astronauts touched down on the moon July 20. To hear the moment of the landing, click on the audio clip to the right.The astronauts spent just over 21.5 hours on the surface. Their entire round trip journey lasted just over eight days. Want to learn more? Check out this official NASA Apollo 11 flight plan. Looking for another color, material, size, engraving, etc of our science jewelry? Send us an email at scichiccontact@gmail.com and we would be happy to work with you!